As we continue the struggle to challenge and topple the prison industrial complex, it is important we take pause to celebrate our successes and learn from our losses. In many ways, 2018 marked a year in which legislation undoing the dark legacies of mass incarceration gained momentum. Led by the inspiring work of our POC-led partners, last year grassroots movements generated enough pressure to pass five vital pieces of criminal justice reform. Together, our actions were part of a targeted and coordinated legislative strategy that elevated the voices of the most impacted, amplified the power of our organizing, and led to some significant legislative victories in California. ​This year, as part of our commitment to confronting white supremacy’s role in creating violence against trans women of color, SURJ Bay Area has continued partnering with the Transgender, Gender-Variant, and Intersex Justice Project (TGIJP). 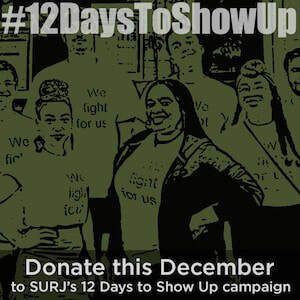 SURJ supports TGIJP in its mission to support transgender, gender variant and intersex people inside and outside of prisons, jails and detention centers. TGIJP is a Black trans woman led organization fighting for self determination, freedom of expression, and gender justice. 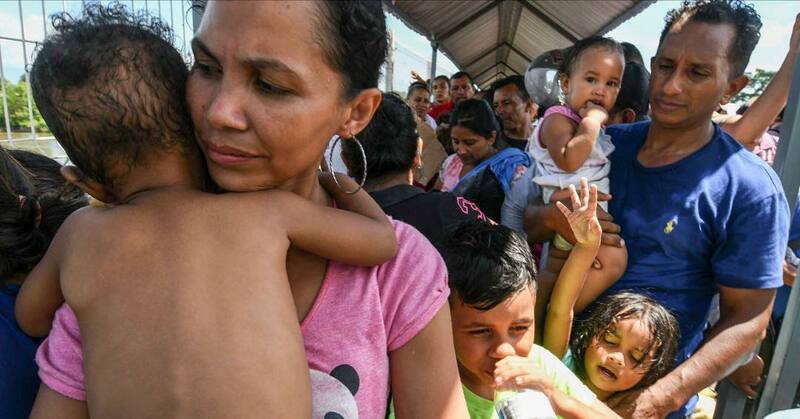 We have become all too familiar with hearing the reports of police brutality against people of color, the statistics of prisons disproportionately crowded with Black and Brown individuals, and the stories of families torn apart by extreme sentencing policies. Our nation’s history of racism is inextricably linked to our prison system and it is critical that we take real steps nowto dismantle this system and reallocate resources to our communities. Stripping communities of their voting rights is a centuries-long tool used to silence and disenfranchise people of color — and it must stop now. 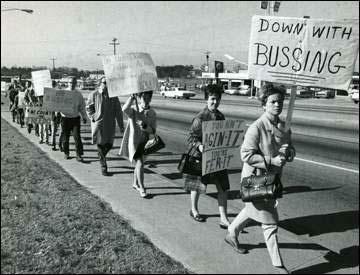 ​The passage of the Voting Rights Act in 1965 was a major victory of the civil rights era. But in the decades since, attacks on voting rights have been relentless. In California, 162,000 citizens — mostly people of color — can’t vote today, simply because they are in state prison or on parole. Essie Justice Group is an organization led by and for cisgender women, trans women, and gender non-conforming folks with incarcerated loved ones, working to transform the criminal justice system and combat mass incarceration. 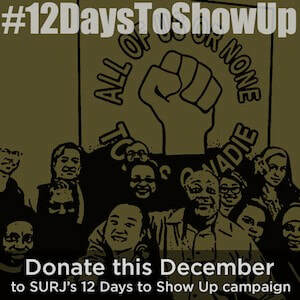 They bring together their members, including Black and Latinx women, formerly and currently incarcerated women, trans women and gender non-conforming folks, to heal, build power, and create structural change rooted in race and gender justice. ​Essie Justice Group’s Healing to Advocacy Program unites women with incarcerated loved ones to do this work together. Each cohort is led by previous program graduates, and cohort members are nominated by their own incarcerated loved ones, one another, or themselves. This past fall they graduated their 17th cohort. Essie members facilitated cohorts in Inglewood, Los Angeles, Vacaville, San Francisco, San Jose, West Oakland, and Fruitvale. ​According to the Sentencing Project’s special report to the United Nations, our criminal justice system is in fact, two systems — one benefiting wealthy white folks, and one deeply disadvantaging black, brown, and poor folks. People of color are disproportionately arrested, tried, and sentenced. This results in the loss of the ability to vote, secure housing, and find a job, among other human and civil rights. What’s one of the most effective ways to dismantle white supremacy? ​Our SURJ Bay Area Youth and Families (Y&F) Committee starts at the roots by educating and mobilizing youth, parents, youth workers and educators, as well as partnering with local organizations with a child- and family-centered lens toward racial justice. One of our major partners is Abundant Beginnings, a local community-based organization founded and run by Black queer freedom fighters. Abundant Beginnings uses a kid-friendly vocabulary — defining solidarity, for instance, as “the act of supporting other people (especially those who are not being treated fairly).” We are proud to stand in solidarity with Abundant Beginnings as we work toward a world in which children can grow up free from the injustices of white supremacy. 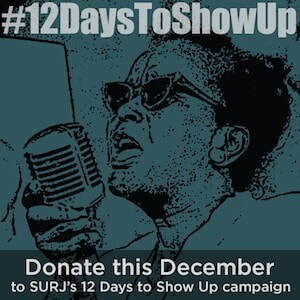 #12DaysToShowUp, Donate to SURJ's 12 Days to Show Up campaign. Background image courtesy CRC Media. ​We look back at that time and those events in disgust and awe. 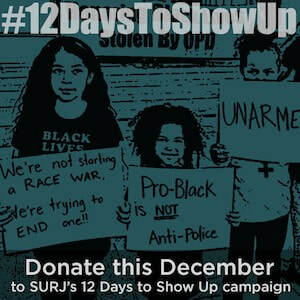 However, we know that targeted repression of Black resistance is unquestionably NOT a thing of the past. We need only look at a 2017 FBI internal report entitled “Black Identity Extremists Likely Motivated to Target Law Enforcement Officers” which seems to have been used to justify surveilling and jailing a black activist — severely disrupting his life — based solely on his Facebook posts calling out police brutality.